Invisalign is a popular orthodontic treatment for people with an irregular bite or tooth irregularity. Invisalign improves the alignment of teeth by using a series of clear, removable aligners. This helps slowly align the teeth. Unlike orthodontic braces, Invisalign doesn’t use metal or wires, and Invisalign is almost invisible due to its transparent appearance. Invisalign is perfect for patients who find wearing metal braces uncomfortable or embarrassing, especially teenagers. They will no longer feel conscious about how they look. Invisalign is also ideal for patients with teeth spacing issue. Patients with improper spacing between their teeth, especially crowding, are suited for Invisalign. On the other hand, those with small teeth and large spaces are better suited for dental veneers. Crowded teeth are a common problem in adults and children. The teeth overlap and twist. The jaw may be too small for the teeth, or the teeth may be large. Cleft lip or palate also causes crowded teeth. If left untreated, teeth crowding can lead to crooked teeth and other dental issues. An overbite is when your upper jaw overlaps your lower jaw. It is common for some patients to have a slight overbite of just one or two millimetres, but others have more severe bite issues. A malocclusion or deep overbite is when the overlap between the upper and lower teeth is more pronounced. An underbite is when your lower teeth extend outward farther than the upper front teeth. This is also called prognathism. It creates a bulldog-like appearance in the mouth and face. Crossbite is a form of malocclusion in which a tooth (or teeth) has a more buccal (closer to the cheek) or lingual (closer to the tongue) position than its corresponding opposite tooth in the upper or lower dental arch. In other words, crossbite is a lateral misalignment of the dental arches. Too much space between two teeth is called a diastema. These spaces can form anywhere in the mouth, but they are often noticeable between the two upper front teeth. Gapped teeth are commonly caused by thumb-sucking. An open bite is a type of malocclusion, or “bad bite,” that may require orthodontic intervention to correct. This should not be confused with an overbite. An open bite is a term used to describe when the upper and lower teeth are unable to meet with each other when the jaws are closed. After a series of comprehensive examinations like X-rays, digital imaging, and teeth impressions, your dentist at DonEast Supreme will create a 3D model of your mouth. The model will be used to develop a method to align your teeth in the best way possible. The Invisalign Company will customise your aligners for you. You will use new sets of aligners every two weeks. 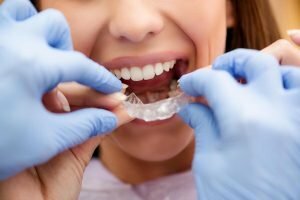 If you don’t feel comfortable correcting your misaligned teeth (or bite) with traditional braces, then Invisalign may be for you. Learn more about Invisalign and call us at (03) 9842 1475 or visit us at 1062 Doncaster Road in Doncaster East.